These are quality, durable decals designed to survive in the harsh underhood environment. They are waterproof, heat resistant and are tear resistant. Each decal is 4" wide, and 2 1/2" tall. Decals are warrantied for 90 days against fading. We recommend installing them on a clean, flat metal or plastic surface. Note: Each decal is intended for a specific engine application in stock form. 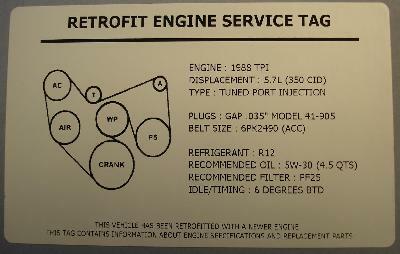 Custom or modified engines may render decal information inaccurate. Please make sure you order the appropriate decal for your engine based on year, original vehicle, and engine type or displacement. Photo shows a sample decal, the actual decal you will receive will vary depending on the application.